A clean face, modern electric fireplace with a modern glass ember bed truly reflects the appearance of a real burning fire. Imagine just opening the box and plugging in a fireplace. Your room is instantly transformed into a space that is cozy and romantic. The EF30G Electric Fireplace will match everything with the clear glass crystal ember bed for a more contemporary feel. You also have the option of a traditional beveled black mantel or the modern Metro mantel. The Metro is a streamlined mantel; available in natural or painted black finish. Instantly change a boring room into the beautiful space it can be with the ambiance and warmth of a fireplace. The convenient on/off switch on the unit or the remote allow you to relax, while remaining in total control of the flame and ember bed brightness. The EF30G’s reflective rear panel mirrors the flames giving you fireplace depth without actually taking up space. The clean face frame allows you an unobstructed view of the realistic flickering flames. The low energy halogen bulbs that provide that beautiful glow don’t use much energy, and will last for over 3,000 hours. Having a gathering but your fireplace is in another room? You can move the EF30G Electric Fireplace from room to room, all you need is a plug to set the mood. Gaze in awe at the sparkling crystals. This fireplace is safe for everyone. It does produce heat, but there is no fire. The tempered glass, while it does get warm, will not cause injury if accidentally touched. This fireplace is great for people who don’t have the budget or venting for an existing fireplace. No installation required, just plug it in and turn it on! Great for a renovation. 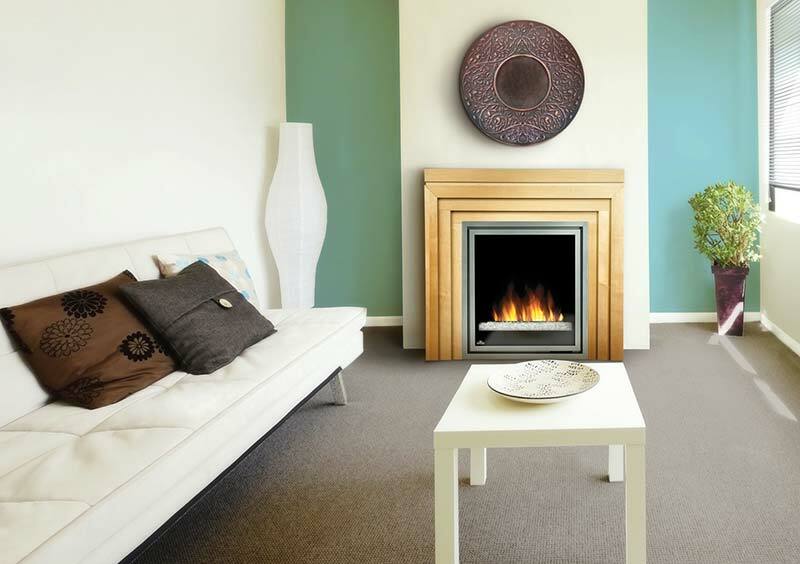 You can also install the EF30G Electric fireplace into a framed wall for inexpensive ambiance. This fireplace can give you the traditional feel or the modern look and everything in between. The options are unlimited. Every EF30 Electric Fireplace by Napoleon comes with the remote, and manual and your choice of logs or clear CRYSTALINE™ glass crystal ember bed.